How do successful people do it? How do they always live life to the fullest, despite numerous obstacles? Are there secrets to their success? 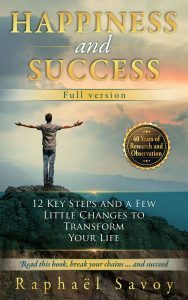 “Happiness and Success – Full version” is the result of 40 years of work and experience that has taken the form of a comprehensive method. Read this book, break your chains … and succeed.